So you’ve finally made the decision to take the time and effort of getting on a plane to Australia. G’day mate. Chances are you’ve flown into the beautiful Sydney! Beautiful, sure. But there is so much more in New South Wales (NSW) to explore, and you’ve probably seen that there’s plenty of material on what to do in Sydney. 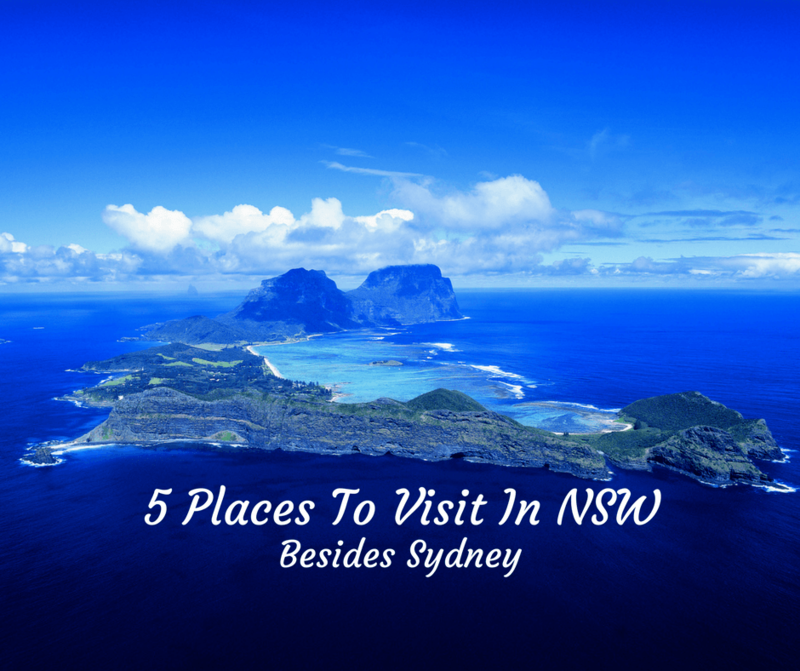 So for this list, I’ve compiled the best places to visit in NSW besides Sydney. Plus you’ll get ultimate bragging rights for travelling beyond the city! If you’re a fan of the bohemian lifestyle, beach, and feeling as if time doesn’t exist, get yourself up to Byron Bay. Byron is famous for its very relaxed lifestyle, and chilled vibes, it is truly an escape from the city. Byron is a melting pot for arts, culture, and meditation, and you’ll see that there are various activities including galleries, yoga retreats, and music festivals like Splendour in the Grass and Bluesfest. Once you get to Byron you’ll really understand why this beach town always draws in the crowds. Additionally, if you’re a fan of road trips the nine hour drive from Sydney is scenic and has beautiful stops along the way. However, if you’re not a fan you have the option of booking flights to Ballina. If you’re looking for a relaxed beach getaway I would suggest avoid travelling in November as the town plays host to thousands of school leavers looking to party and celebrate. Like the sound of Byron but don’t have the time to make the nine hour flight or funds to make the flight? Jervis Bay is the answer for you! Jervis Bay is located an easy 3 hour drive from Sydney making it a great weekend getaway destination for Sydney-siders. This quaint beach town offers a look into the chilled beach lifestyle of Australia, away from the hustle and bustle of developed cities and towns. Here, you’ll feel like time has stopped and you’re officially on beach time. You won’t need to bring much when it comes to spending the weekend at Jervis Bay; expect to spend your days lazing around on the beach, eating a drawn out brunch, with maybe a paddleboard or kayak session between there. Ever wanted to experience a private island all to yourself but don’t have the funds? Lord Howe Island only allows 400 visitors at any one time which is pretty damn close to a private island. Lord Howe Island is THE island escape, with stunning scenery especially viewed from the top of the hikable Mount Gower. The island is not only a host to travellers, but also to giant flocks of seabirds that nest there during the year – a bird watchers dream! Additionally, not to mention the extensive number of fish and marine life that calls the reefs around the island home. On this island, you’ll find yourself spending the days laying on the beach, fishing (for your dinner! ), and trekking up to see the island from above! The only way to get to Lord Howe Island is to book flights to Lord Howe Island. You’ll often hear about Australia’s largest wine region, the Hunter Valley, but only true locals will know that Australia’s wine region lies in the Mudgee. Mudgee is a town rich in history, culture, and fantastic wines and foods, but does not draw in the large crowds like the Hunter Valley. One of the great things about Mudgee is the tree lined streets are wide enough to allow for cycling between wineries. At the wineries, there are often restaurants that pair the excellent wine with fantastic food. The Mudgee Region is not only famous for their wine, but the region also produces olive oil, honey, fruits, and much more so you’ll see that when you’re eating in the area they’re only using the freshest local produce, and it makes a difference! Located only a 90 minute drive west from Sydney, the Blue Mountains makes for a popular weekend or day trip destination. The world heritage listed Blue Mountains is the nature lover’s dream come true, with stunning valleys, rugged sandstone, and eucalyptus forest stretching far as the eye can see. Additionally, if you’re looking to be active and experience the area up close and personal via a hike, you’ll be able to check out the underlying Aboriginal culture, geology, and biology of the environment. If you’re not too worried about dark underground places, be sure to check out the Jenolan Caves – with natural limestone structures, and underground rivers. Since the tunnels are extensive there are a range of tours, from easy walk, to ones that require harnesses. After a more challenging walk? Try out the walk down Wentworth Falls, the walk follows down the side of the mountains and is quite steep, but from the bottom you’ll get to look up and see that water trickle down from the cliff, glistening in the sun. So there you have it my top picks for getting out of Sydney, and really seeing what Australia is all about! Take it from a Sydneysider, there is so much more to see than the usual tourist spots you’ve probably heard about. So why not get out the city, and explore regions that don’t draw the big crowds but really encapsulate the Aussie way of life! About The Author: Alex Johnson is a blogger and lover of the little things in life, from delicious brunch spots to interior design. Recently moving to Sydney, he began his blog Inspire A Better Life to positively influence others to get out there and see all life has to offer. Join Alex as he discovers this life one day at a time, documenting his thoughts and others along the way! Interesting read! I’m heading back to Australia for my 3rd time next year, I’ve visited the Blue Mountains before but we’ll be driving from Gold Coast back down to Sydney and one stop I was planning was in Byron Bay! We haven’t done as much travelling around NSW as the rest of Australia. I’ve heard of Byron bay and the Blue Mountains before, though not the others. Thanks for the tips! We’re thinking about travelling to Australia in the new year. Best to read about where to go … we’re planning a trip there and it will be our first time! Mudgee sounds like my kind of place! I have not been to Australia and although I had heard of these places before, I didn’t realize their proximity to Sydney. I definitely want to hit all these places especially Lorde Howe Island. Will have to make sure to apply for those entry permits to make sure we can get to visit. Wow, they are all so spectacular how would you pick? I have read about Byron Bay before and seen several incredible pictures. By the way, these are stellar as well! I’d love to go back and see every place on your list, especially diving Lord Howe Island!